Who knew that the idyllic Mt. Zugerberg in central Switzerland marks a cornerstone for famous politicians, scientists and filmmakers around the world? Take John F. Kerry, the former US Secretary of State, who completed his studies there. New York based actress, Geraldine Dulex, as well as Gul Hurgel, a world-renowned fashion designer originally from Turkey, are both alumni. On the scientific end of the spectrum is the late Willem P.C. Stemmer, a Dutch scientist who was honored for his pioneering contributions to directed evolution which won the Nobel Prize in Chemistry in 2018. Another illustrious name associated with Institut Montana Zugerberg is Swiss filmmaker, Marc Forster, who is known for blockbusters such as James Bond: Quantum of Solace. Meet Institut Montana Zugerberg, a Swiss international day and boarding school known for covering many fields and vocations. From scientists to politicians and film directors, the school’s vibrant alumni are a diverse group of passionate people who share the same background and values. The boarding school was founded in 1926 by Dr. Max Husmann, an educator and peacemaker who had been involved in Operation Sunrise, a series of secret discussions that helped end World War II. After witnessing the atrocities of World War I, Husmann set up Institut Montana Zugerberg with the main objective to contribute in a practical way towards the realization of world peace. These founding principles still guide the school today. The founder’s educational philosophy focused on teaching the values of internationalism, individualism and integration. It focused on respecting and nurturing the individuality of students, while guiding them to a life of responsibility and independence. To this day, the school focuses on individualized attention in the framework of an international education. Today, this international day school and boarding school has about 300 students from over 40 nationalities. The mountaintop setting in central Switzerland ensures a healthy environment for the students to become well-rounded individuals. 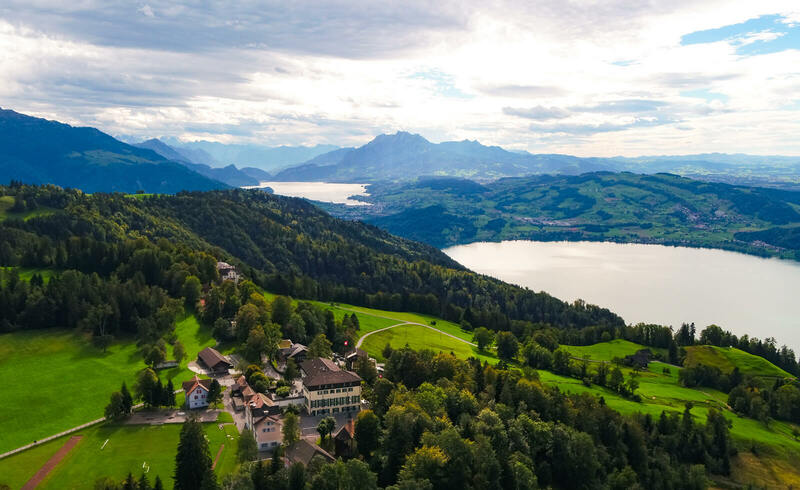 As a Swiss international day school and boarding school, Institut Montana Zugerberg understands the importance of a Swiss quality education alongside an international environment. It has been a tried and true setting for almost 100 years, ensuring that students can set the course for their adult lives. The school’s motto of “My Place to Grow” is more than just a phrase – it is shown on their emblem with a young plant that grows strong roots in an international environment and a global mindset. Just like a tree is able to withstand various and drastic changes that the world goes through, so too does this school and their students. They are on the right path to becoming global citizens with an open mind and an eagerness to give back to the world in one way or another. The school’s forward-thinking education emphasizes adaptable skills and personalized care, as well as the founding values of internationalism, individualism and integration. This philosophy appears to be the key to maintaining a legacy for almost a century. Institut Montana Zugerberg starts to accept students into their bilingual elementary school at the age of six. Those who remain enrolled have excellent chances of becoming fully bilingual in English and German by the age of 12. Bilingualism not only brings short-term successes in the educational realm. In their careers, job opportunities for bilinguals outweigh those for monolinguals. This is because someone who speaks two or more languages is able to get more information from more places, participate in the global community in a variety of ways and understand people from cultures other than their own. The institute also provides a bilingual secondary school. This is especially helpful for those students who have struggled in elementary school and need an academic boost before entering the high school level. Small classes and individualized support at every grade ensure that students are equipped with the tools they need to strengthen their talents and improve on their weaknesses. For grades 7 to 12, the school offers either a Swiss high school diploma, the Swiss Matura or the International Baccalaureate Diploma (IB) program. The choice of program will depend on where a student intends to go in life. Compared to the IB program, a much smaller number of students who complete the Swiss Matura go on to study outside of Switzerland. Thus, the Swiss degree is not as widely recognized. But Switzerland has its own excellent, highly ranked universities with very low fees such as ETH, which is ranked seventh in the world for universities and EPFL which is one of Europe’s most famous science and technology institutions. On the other hand, the IB Diploma is a great program for those who wish to increase their chances for getting into a top university outside of Switzerland. After all, the IB Diploma has a higher percentage of acceptance to universities than any other degree in the world. The co-ed institute offers attractive two- or four-week summer sessions for students aged 10 to 15 who are looking to learn or improve their German or English. The curriculum includes themed workshops related to business, science and arts alongside a variety of afternoon activities. If you are looking for a place for your child to thrive, why not consider a school with a deeply rooted history and a mission to make your child the best version of themselves?